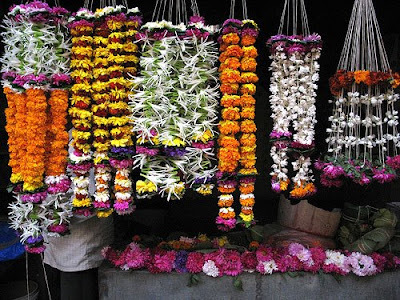 HINDU RITUALS AND ROUTINES...: Why is a specific flower offered to a God ? Meaning:Ahimsa (non-violence)is the first flowerControlling of the senses is the second flowerCompassion for ALL BEINGS is the third flowerQuality of Forgiveness is the fourthKnowledge the fifth, Austerity the sixthand Concentration the sevenTruth is the eighth flowerAll eight of these flowers are dear to Vishnu. Some things in human life are beyond the realm of intellect. Modern science cannot explain them. And that is where the science of spirituality enters in the life of man! Every individual has his own seat or icon of faith. In order to be constantly graced by that seat or person the individual is always engaged in efforts according to his capacity. The daily worship is an indivisible part of those efforts. According to the path of devotion (Bhaktiyog) ritualistic worship or puja is an important stage in process of worship! For performing ritualistic worship of a deity filled with bhav or spiritual emotion various tools and articles are required. Every article of puja has its own significance as per the science of spirituality or Holy Scriptures. Besides there are certain methods of their arrangement during a puja ritual. We have seen in the previous satsangs the spiritual significance of such ingredients of puja materials like haldi, kumkum, sandalwood, akshta etc. No puja ritual of a deity is complete without use of flowers. If we know such things as which flowers or leaves are to be offered to a particular deity, in what numbers and their spiritual benefits then we will get more benefit from puja ritual. So let us start with an important ingredient of puja articles namely flowers. There are subtle frequencies of deities active in the atmosphere. These frequencies are attracted towards certain flowers. These frequencies are then emitted back into atmosphere and are then known as ‘pavitrak’. Before we come to the topic of spiritual benefits of offering flowers, let us first see the difference between frequencies and pavitraks. * The subtle principle of deities attracted to a flower from space is called frequencies while the same deity principle when gets emited into atmosphere is called as pavitrak. * The frequencies are subtle most and comparatively more unmanifest (nirgun) form of deity principle while a pavitrak is the subtle and manifest form of the same deity principle. 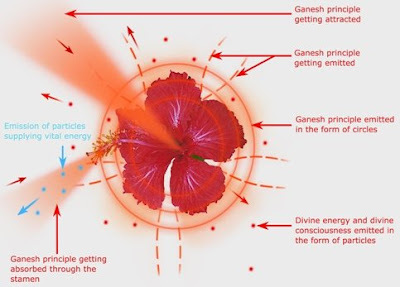 * The Ganesh principle present in the universe gets attracted towards the central space of the red coloured Hibiscus flower and is emitted in the form of circles. * The Ganesh principle which is absorbed by the stem of the flower gets emitted through the petals in the atmosphere. * The stamen of the flower absorbs the Ganesh principle present in the atmosphere and emits the particles which donate vital energy or pranshakti. * The Hibiscus flower is of raja-sattva nature. As a result divine energy (shakti) and divine consciousness (chaitanya) are emitted from its petals. Thus this subtle drawing must have made it clear to our viewers as to how the frequencies of deity principles are attracted towards flower and how through the medium of various parts of flower the same deity frequencies are emitted in the atmosphere in the form of pavitraks. Thus it is quite clear that the emission or projection of deity principles and pavitraks is a process taking place at a spiritual level. The effect of this process is multifold. One of this is reduction in the strengh of raja-tama principle present in the atmosphere. The negative energies present in the atmosphere get distressed due to the deity principle pavitraks projected by the sattvik flowers. Their tama component dominated energy or what we call as black energy is either reduce or gets destroyed. In short the sattvik flowers fight with the negative energies present in the atmosphere by emitting frequencies of deity principles. Such flowers when brought into contact with a person suffering from the distress of negative energy then the negative energy which has entered the person subsides. To understand this topic clearly will have to first know the distinction between ‘Negative energy’ and ‘black energy’. There are some distressing energies in the atmosphere which trouble us. They are subtle in nature. They are called ‘negative energies’. The energy of deities is known by the terms such as chaitanya (divine consciousness), bliss(ananda) and shanti (peace) while the energy of negative energies is known as ‘black energy’. The deities are sattva predominant while the negative energies are tama predominant! A deity looks after our welfare whereas negative energies does us harm. When a person is severely affected by the negative energy distress, his control over his mind, body and intellect is reduced and that of negative energy is increased. This affects the thoughts, emotions etc of the person. Such an affected person when come in contact with an atmosphere predominant in sattva component then there is friction between the positive sattva atmosphere and negative energy. This can manifest in various forms. This may be in the form of a simple thought of leaving the place or a violent reaction. Sometimes these destructive thoughts can become manifest on a physical level. Under such circumstances the negative energy may manifest grossly in the form of sudden burst of anger, shouting, throwing of objects and not only this, it may take any form of destruction such as plundering and breaking of surrounding things. This must have definitely introduced you to the topic of distressing or negative energies. So let us move back to the original topic where we are going to see the effect of sattvik flowers on negative energies. Let us see the effect of hibiscus flower on the woman suffering from distress of negative energy in the subtle dimension with the help of a subtle drawing. * Shri Ganesh principle frequencies present in the universe get attracted to the Hibiscus flower. 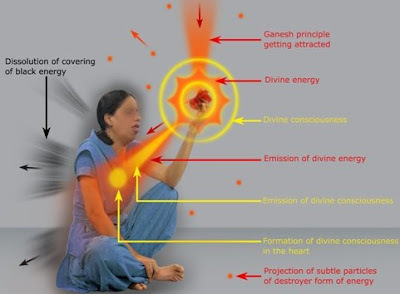 * The attracted frequencies get converted into shakti and chaitanya and are emitted in the atmosphere. * The emitted energy is of destroyer type that it reduces the covering of black energy generated by the negative energy around the woman. * There is formation of chaitanya in the heart of the woman as a result of emitted chaitanya. * The subtle particles of destroyer form of energy are projected in the atmosphere. This subtle drawing must have helped you to understand the importance of sattvik flowers. When we offer such sattvik flowers to a deity during puja then the deity frequencies are emitted from the flowers on a large scale. This not only benefits the worshipper but also makes the surrounding atmosphere sattvik. Normally we have a concept that a deity is to be offered only that flower which he/she likes. But is it really so? Let us see the actual reason according to science of spirituality. To cite some examples white flower like that of Dhatura is offered to Lord Shiva, red cloured flower like Hibiscus for Shri Ganesh, and red coloured flowers for Durga devi also. If the worshipper has more spiritual emotion for these flowers then the frequencies of deities get more activated through the medium of these flowers and work for the worshipper directly. Why should one only offer fresh flowers to the deity? * Whatever we offer to a deity is accepted by the deity on a subtle level and then They get pleased and bless us. Therefore whatever we offer to Them has to be best. * The capacity of a flower to absorb and emit the frequencies of deity and sattvik frequencies gets reduced if it is dry or infested with insects. Another important thing is that it is also prohibited to offer the flower which is already been offered (nirmalya) that is which has become stale. The basic science underlying this is that the flowers are used mainly for their colours rather than their fragrance. When the flowers become stale its colour changes. And as the colour changes the reception of frequencies of deity decreases and later stops. Therefore we have to offer fresh flowers to a deity on a daily basis after removing the flowers offered on the previous day. Besides this there are other prohibitions applicable to flowers to be offered to a deity. * We should not offer a flower which we have touched to the body, have handled with left hand or have taken smell of it. * We should not offer a flower which is without any fragrance or has very strong fragrance has fallen on the ground or on unclean surface. * A flower which is not bloomed up fully, or has its petals withered should not be offered. * It is not advisable to offer flower buds to deities as per spiritual science. * Flowers stolen from another's house thus making them unhappy are not to be offered. * The flowers plucked with undergarmants still on, or the one which are wrapped in the leaves of arka (rui or calatropis) or rend leaves should not be offered to a deity. * It is prohibited to offer flower which is dipped or washed in water. * Flower buds are not offered to a deity but lotus is an exception. * The flowers brought from the house of a gardener can not be called as stale. * Though we do not wash the flowers with water by dipping them but we can always sprinkle them with it. Why it is not advisable to pluck buds after the sunset? The life cycle of the living beings runs according to the cycle of nature. Taking this into consideration the right time for every thing in our life has been considered in Sanatan Hindu Dharma. Similarly there is definite time for pluking of flowers according to scriptures. Nowadays some people collect buds by pluking them on the prvious evening. But this incorrect as per the science of spirituality. Now let us understand why it is not advisable to pluck buds after the sunset. At Bramha muhurta the pavitraks of deities are projected on a large scale on to the earth. These pavitraks get attracted on a greater scale towards those flowers who have the capacity to attract pavitraks of particular deity. The sunlight causes the disintegration of raja-tama particles present in the atmosphere. Therefore the atmosphere before the sunset is more sattvik as compared to that after the sunset. However there are some exceptions to this rule. For example there are some flowers whose buds start opening at the sunset itself like those of bela, chameli and rajanigandha etc. These buds eagerly wait for the Bramha muhurta. It is as if they are eager to surrender themselves at the feet of the deity. These flowers have more fragrance when compared to other flowers. That is why the deity principles get attracted towards these flowers in large amount. * Do not pluck flowers for puja ritual with your shoes on. * Express gratitude to the plant from which you are going to pluck the flowers. * While pluking flowers for puja ritual pray to the deity that the objective of offering the flowers for puja be fulfilled. * Pluck only that number of flowers as is necessary for the the puja ritual. Do the chanting of your favourite deity while plucking the flowers. Which flowers should be offered to a particular deity? Thus we have seen why a particular flower is offered to a particular deity, what is the appropriate time of pluking the flowers according to science of spirituality. The spiritual science has also shown us that a particular deity needs to be offered a particular flower in particular number. Let us understand this with the help of the points below. * Shri Ram should be offered 4 flowers of Jai. * Shri Krushna should be offered 3 flowers of Krushna Kamal.